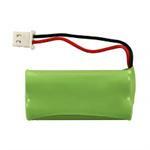 BT-266342 : 2.4v 800mAh NiMH battery for V-Tech, AT&T, GE Cordless phones. Replaces battery model #s: CR1227, AT&T BT166342, BT266342; V-TECH 89-1347-01-00, 89-1347-02-00, BT1183342, BT1623421, BT162342, BT166342, BT262342, BT266342, BT-266342, BT283342, etc. Fits V-Tech phones: 6001, 6105, 6185, 6214, 6224, 6326, 6375, 6501, 6509, 6511, 6519, 6521, 6522, 6529, 6601, 6609, 6619, 6629, 6641, 6642, 6648, 6649, CL82400, CL82500, CS6124, CS6309, CS6319, CS6328, CS6329, CS6428, CS6428-2, CS6429, CS6429-15, CS6429-16, CS6429-2, CS6429-3, CS6429-4, CS6429-5, CS6509, CS6509-14, CS6509-15, CS6509-16, CS6519, CS6529, CS6529-2, CS6609, CS6619, CS6709, CS6719, CS6719-15, CS6719-16, CS6719-2, CS6729, CS6729-2, CS6729-21, CS6729-3, CS6729-4, CS6729-4D, CS6729-5, CS6758, CS6758-3, CS6759, CS6759-3, CS6859, CS6859-2, CS6859-3, CS6859-4, CS80100, CS81100, CS82100, CS82300, CS82350, DS6501, DS6511, DS6511-4A, DS6521, DS6521-2, DS6521-3, DS6522-3, DS6522-32, DS6522-4, DS6601, DS6641, DS641-2, DS6642, DS6648-2, DS6649, DS6649-2, DS6649-3, DS6671, DS6671-2, DS6671-3, DS6671-4, DS6672, DS6672-4, DS6701, DS6751, DS6751-2, DS6751-3, FS6214, FS6224, IS7101, IS7121, IS7121-2, IS7121-22, LS6001, LS6105, LS6185, LS6305, LS6315, LS6325, LS6375, SN1157, SN1196, SN1197, SN6107, SN6127, SN6127-2, SN6416, SN6146-2, SN6147, SN6147-2, SN6187, SN6196, SN6196-2, SN6197, etc.